Little, Brown Spark, 9780316349123, 384pp. From the founding director of the MIT Center for Collective Intelligence comes a fascinating look at the remarkable capacity for intelligence exhibited by groups of people and computers working together. If you're like most people, you probably believe that humans are the most intelligent animals on our planet. But there's another kind of entity that can be far smarter: groups of people. In this groundbreaking book, Thomas Malone, the founding director of the MIT Center for Collective Intelligence, shows how groups of people working together in superminds -- like hierarchies, markets, democracies, and communities -- have been responsible for almost all human achievements in business, government, science, and beyond. And these collectively intelligent human groups are about to get much smarter. 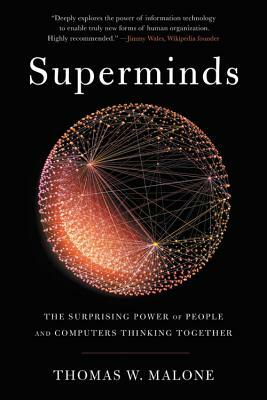 Using dozens of striking examples and case studies, Malone shows how computers can help create more intelligent superminds simply by connecting humans to one another in a variety of rich, new ways. And although it will probably happen more gradually than many people expect, artificially intelligent computers will amplify the power of these superminds by doing increasingly complex kinds of thinking. Together, these changes will have far-reaching implications for everything from the way we buy groceries and plan business strategies to how we respond to climate change, and even for democracy itself. By understanding how these collectively intelligent groups work, we can learn how to harness their genius to achieve our human goals. Drawing on cutting-edge science and insights from a remarkable range of disciplines, Superminds articulates a bold -- and utterly fascinating -- picture of the future that will change the ways you work and live, both with other people and with computers. Thomas W. Malone is the Patrick J. McGovern Professor of Management, a professor of information technology, and a professor of work and organizational studies at the MIT Sloan School of Management. He is also the founding director of the MIT Center for Collective Intelligence and was one of the two founding co-directors of the MIT Initiative on "Inventing the Organizations of the 21st Century." Malone is the author of The Future of Work and more than 100 articles, research papers, and book chapters. He has also been a cofounder of four software companies; an inventor on 11 patents; and a co-editor of four books. "In this fascinating book, Tom Malone introduces us to new vistas of human capability and creativity achievable through collective intelligence. By thinking imaginatively about our future, Malone helps us think differently about the present." "Humans plus computers and networks have enormous potential. How can such wee creatures as ourselves take advantage of this potential? Malone addresses this question in a concrete way, laying the foundation for a new discipline: the systems engineering of superminds. "—Vernor Vinge, Hugo Award-winning science fiction author, and originator of the "technological singularity" concept. "Malone takes us on an intentional journey into thinking about thought, intelligence, reasoning, and consciousness. He sees these notions in extremely broad terms that have changed my views of what it means to 'think. '"—Vint Cerf, VP, Google, and one of the "fathers of the Internet"
"A remarkable journey into the basic structures -- markets, hierarchies, democracies and more -- that have advanced civilization throughout history and now bring us to a turning point where the complex problems facing humanity can be addressed by people and computers working together in totally new ways. A must read."